Need some assistance? 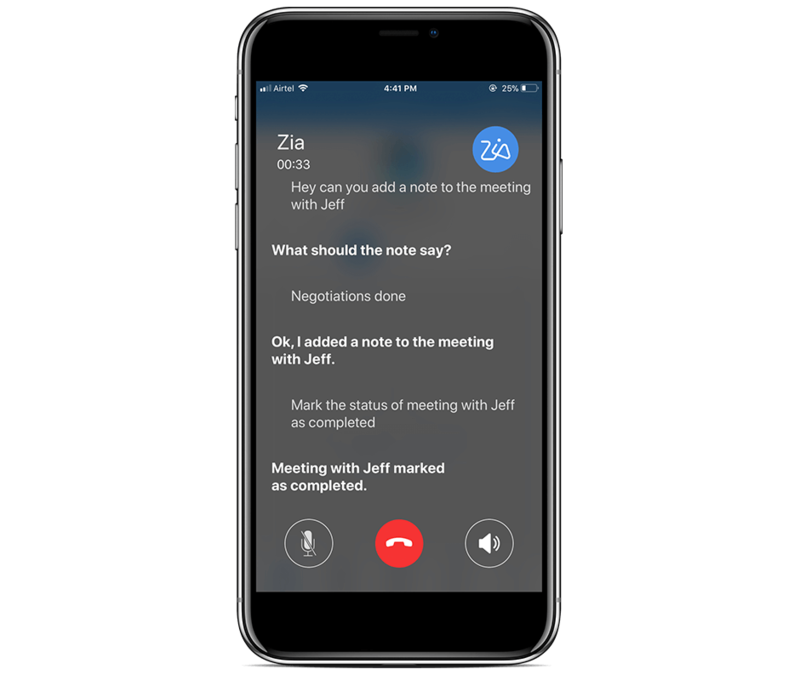 Ask Zia, the conversational AI assistant for Zoho CRM. Zia is here to assist with everything from simple data to complex analytics. 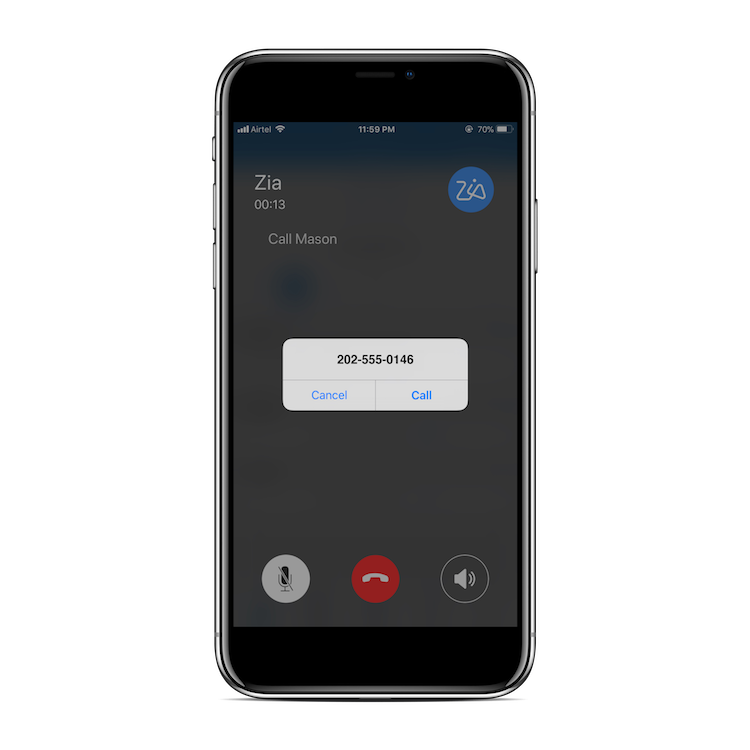 Talking to Zia is as simple as chatting with her from the bottom of your desktop screen, or calling her from your mobile app. 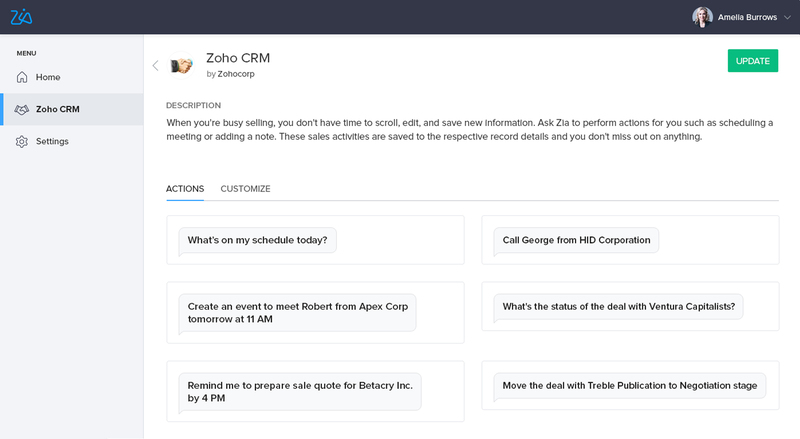 Zia has all the answers—at least from your CRM. CRM may be a database, but often you want to skip the data and get to the point. Zia does that for you. From simple data, like call counts for the day or for complex calculations, all you have to do is ask. Chat with Zia using the 'Ask Zia' button at the bottom of your desktop screen or call her on your mobile to get easy access to your information. The gateway to a faster sale. When you're busy selling, you don't have time to scroll, edit, and save new information. Instead, ask Zia to perform actions for you such as making a chart from your CRM data or calling a customer. Say it and forget about it. Whether it's placing an order or changing a status, give Zia the specifics and she'll get it done for you. Zia also prompts you for information you may have forgotten, such as the exact time to schedule a meeting. These sales activities are saved to the respective record details so you don't miss out on anything. Every company has its own lingo. It might be hard for your newbies to catch on, but it's not hard for Zia. In the past year, Zia has been learning how to speak 'sales' from our own sales team at Zoho and you can teach her how to speak to your language too. Customize actions for Zia to perform with the terminology that your team uses. Setup the flow of questions, so Zia remembers to ask for information that your team may miss. A call away from assistance. Out selling? Take your assistant with you. Getting in touch with Zia is as simple as opening an app: your Zoho CRM app. Zia is accessible on Zoho CRM's iOS mobile apps, at no extra cost.